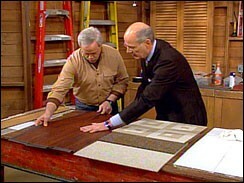 On the CBS Early Show this morning, they ran a special on do-it-yourself flooring options as inexpensive ways to improve a room’s look. According to Danny Lipford, host of Today’s Homeowner, "One of the best ways to change the look of a room is to change the flooring." Two of the flooring ideas were very easy to do, and relatively inexpensive, too! As I see it, if you’re on a budget, and you can’t afford solid hardwood flooring or thick plush carpet at this time… these DIY options will have everyone fooled. Some choose this type of flooring for their entire home, including great rooms and kitchens. Others prefer to use it only in the in smaller rooms like the pantry, laundry room, or bathroom — places where you may want to invest more in the appliances, cabinetry, and decorations than the flooring itself. Just the same… these DIY flooring systems are quite popular in basements these days. The best part: No more old-fashioned peel & stick floors! It looks like a very high end hardwood floor and the vinyl planks stick to each other, so no messy adhesives are used. In fact, the manufacturer claims that only a razor knife is needed to install this floor. It comes in three finishes — light oak, hickory and cherry — and can be installed on top of any existing hard surface, such as vinyl or concrete. The best part is the price. It only costs $1.69 per square foot. It’s called "fuse flooring" because it’s tacky on back, yet requires no glue or tools. These were designed specifically for the do-it-yourselfer. Each carpet panel is just under 2′ x 2′ and is straight on two sides and features unique wave edges on the other two sides that interlock. The material that holds each panel to the floor is the specialized padding manufactured into the back of the panels that grips the floor, keeping each panel right where you set it down…. Easy installation is only part of the story. Since the carpet panels are precisely engineered they can be moved at will. So, if your children are drawing with permanent markers and get ink on the carpet, you can simply lift out the stained panel and replace it with a new one, or you can switch it with a panel located under a sofa where the stain won’t show. The material will run about $2.67 per square foot. Check out these tips for installing carpet tiles.